In a previous post I mentioned my admiration for Tessa Kiros and her fine cookbook Apples for Jam. I adore this cookbook and in my opinion it is written for me. My particular copy is far from being gently used. The dust cover is tattered and torn and many of its pages are a bit warped and spattered with the ingredients the recipe is calling for. I thought about picking up a nice new crisp copy, but then realized I couldn’t possibly replace my characterized volume. On a visit to the library the other day I acquired another one of Tessa’s cookbooks, Venezia. Looking through the recipes I stumbled upon this vegetable risotto. With all ingredients in season I decided we would have this for dinner. Being a borrowed book from the library I just better keep the pages clean! This risotto recipe was terrific. It had all the substantial textures and flavor you want from a spring vegetable risotto. The crispy artichoke was a impressive way to top it off. When you prepare the artichokes I found it is very important to make sure you completely cut the tough parts of the leaves off. Next time I prepare this I will use baby artichokes if they are in season. I treasure baby artichokes because the whole globe is tender therefore no need to cut so much away and the hairy choke is nonexistent. To prepare the artichoke, trim away the tough outer leaves and slice off the top. Halve the artichoke and remove the hairy choke. Cut into thin slices. Place in a bowl with cold water and lemon juice to prevent them from darkening. To simplify the process, have all your ingredients prepared and measured before you start cooking the risotto. Heat the olive oil in a large deep skillet and sauté the onion until softened. Add the asparagus, zucchini and peas and sauté on high heat for a few minutes. Add the rice, mix through the vegetables to coat well. Season with salt and pepper, add the wine and allow it to bubble away. Add 2 cups of hot broth, lower the heat and simmer for about 10 minutes until the broth has been absorbed. Add another cup of hot broth, stirring gently. Do not allow the risotto to get too dry. Continue to add a cup of hot broth when necessary as it is absorbed, for about 20 minutes, or until the rice is tender. Remove from heat and gently add butter, parmesan and parsley. Just before your risotto is ready, drain the artichokes, pat dry with paper towels and lightly dip each side in flour. Using a non stick skillet cover the bottom with olive oil and fry artichokes until golden and crisp on both sides. Transfer onto paper towels to s0ak off excessive oil. 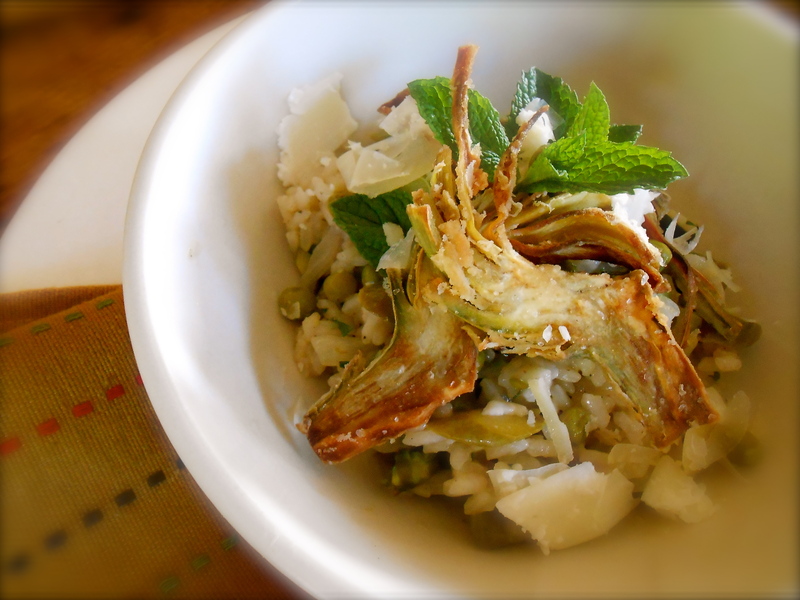 Serve the risotto with a heap of fried artichokes, fresh mint and extra parmesan. I do love a risotto, artichoke is not something I have cooked with (apart from the ‘antipasti’ ones in a jar. I must give them a go. This looks delicious. In Spain they also sell very nice deep frozen (baby) artichoke hearts. Personally, I prefer these above the canned ones (of which the taste changes, even if they are not marinaded, and, they are generally too soft). I hope you can get those frozen creatures over there… (where ever that is… ;) … and give it a try….? I think I have seen the frozen ones. (I’m in Seattle, Washington…USA) I agree, the canned artichokes are too soft. And, if at all possible…stay fresh! Have a great weekend..where ever you are…;) ! Thanks. I’ll bear that in mind. Great use of so many wonderful vegetables! Great! Hope you like it if you make it! artichoke is a picey veggie items in Indonesia..
i love the way you comine the texture too…. Is it pricey? It can be here to at times too. Thanks! i brought a pairs for about 7 USD…. Looks so delicious, I have to get that cookbook. This is a recipe that I know I would love! I think I have cooked just about everything in Apples for Jam. Her book Venezia, which is where this risotto recipe came from is good too, but, Apples for Jam is my favorite. Tess Kiros is a well loved Aussie. I also have Apples for Jam and my daughter is devoted to her copy of Falling Cloudberries, but it’s her latest book Limoncello and Linen Water that I love. She is so lucky to have has such diverse cultural influences on her life. The risotto looks great! I agree with all your “facts”! :) Thank you! I just bought this beautiful book! Your risotto looks grand. Which one? Apples for Jam or Venezia? I’m curious. Venezia. I’d been eyeing it for some time at a discount bookstore that I frequent and finally picked it up. Beautiful pics and I love the memories of Venice, even if I don’t always love Venetian food. I’m on the lookout for her others though. Do you have the Falling Cloudberries book? I’m always seeing people laud it. That looks particularly good. I must add it to my risotto list. We had lobster risotto last weekend. That was pretty tasty too. I don’t know this cookbook author but I must definitely check her out, her books sound wonderful. Your risotto dish looks utterly delicious with that crispy artichoke sitting on top. Just beautiful! Thank you! You really must search Tessa Kiros. She really inspires me. You will really enjoy her recipes. My Favourite Cookery Books – I Have Them All – They Are Fabulous! I don’t quite have all of them…almost! I need to complete my library though. Those fried artichokes look amazing, Seana! I still have to find baby artichokes from the supermarket. Perhaps it’s not the right season yet and should wait for Spring-Summer in NZ? Or wait till I get to Portland in August if it’s still in season. Then my first recipe overseas will have artichokes in it! Yes! Hopefully you’ll find them in Portland in August. Nice to hear from you Dolly! Oh, I’ll definitely look out for baby artichokes. I haven’t seen them before but I imagine they’d be so much easier to prepare. The fried crispy artichoke is such a wonderful addition to top it all up. I want to make this. But I’ll need to search for a good artichoke first. what would you suggest to replace artichoke? Artichokes and lemons… be still my heart. LOVE the crispy artichoke on top of the risotto!!! 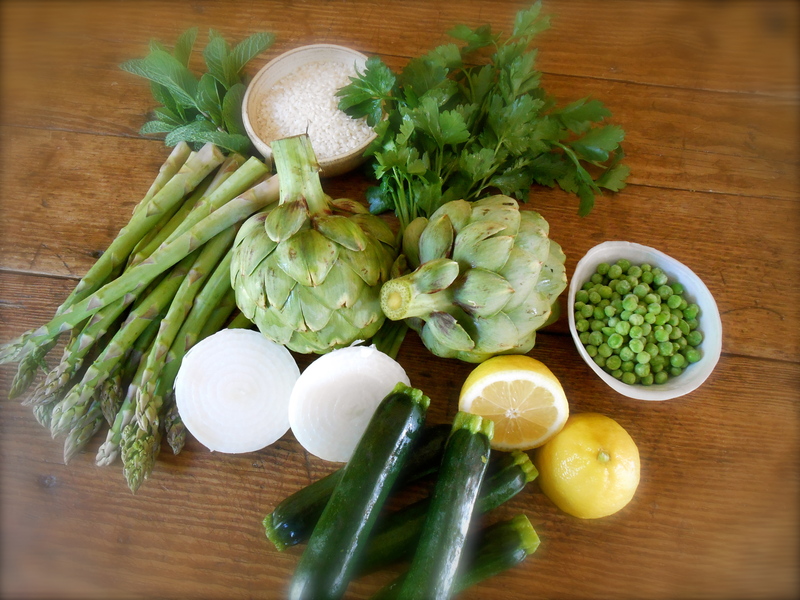 Beautiful summer risotto; love the idea of the artichokes and lemons! Artichokes are awesome, you have to put in the effort to get the good bits, but it’s completely worth it. I’m definitely going to give this recipe a try! What a beautiful, seasonal risotto. Tessa Kiros really is just great, and you’ve done a fabulous job with her recipe. Thank you so much Georgina. I always love making Tessa’s recipes. Some of my most enjoyable times in the kitchen are with her cookbooks open! You are currently reading vegetable risotto (risotto di verdure) at COTTAGE GROVE HOUSE.